Grace E. Kelso Garner was EWGS President in 1978. Grace was born April 13, 1907 in Reardan to Edgor G.(Isaac) Kelso from Virginia and Harriett L. Brill from West Virginia. She was reared in the Deer Park-Clayton area and September 4, 1926 married Cecil C. Garner born 1900 in Missouri, son of Joe L. Garner of Missouri and Bettie Clement of Tennessee. Grace was a timekeeper for the Sunshine Mine in Kellogg, Idaho from 1932 to 1942 and the for the Bunker Hill Zinc Plant from 1943 to 1947. From 1947 to 1966 Grace and Cecil owned and operated grocery stores in Espanola and Sprague, Washington. Grace had also been active as a precinct worker for the election board. Grace wrote three books on early settlers in Virginia where her parents were born. She also authored the first three obituary books done by EWGS after 1980 when the Patchen file changed from 3x5 cards to books. Cecil Garner died May 1, 1982 in Spokane and is buried in Greenwood Memorial Terrace Cemetery. Grace died January 8, 1985 visiting her daughter Carol Ingle in Kellogg, Idaho and she is also buried at Greenwood Memorial Terrace. The New England Historical and Genealogical Society presented a day long seminar in September, 1978, at Cheney Cowles Museum. The Subject was "Research in New England". This is the last comment from Carrie Lartigue: 1978 Mrs. Cecil (Grace) Garner. Grace took overt the Obituary cards for several years, did most of the indexing and cut all the stencils for the Roster of Ohio Soldiers War of 1812; she serves on the Helper committee, fills in at workshops and has published several books on West Virginia (sic), the area of her research. Also Grace and Cecil helped with the tombstone project. At this point Carrie had to give up active membership in EWGS due to poor health. Raymond J. Fisher was EWGS President 1976 and 1977. Ray was born August 23, 1923 son of Guy Ragan and Ruby Lavia (Bunt) Fisher. Ray graduated from Dayton High school and Kinman Business University. He had been a Corporal in the US Army from 1945 to 1947. Ray was an accountant and he retired in 1991. Ray collected old post cards and liked genealogy, reading, woodworking and local history. 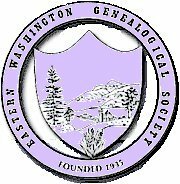 He was a life member of EWGS and a member of the Eastern Washington Historical Society, the Society of Genealogy of London, the National Genealogical Society and the Pike County, Illinois Genealogy Society. If you check the Spokane Public Library catalog you find Ray was the author of an Index to Township Maps 1905, Mason School Records, and a Directory of School District Officers of Spokane County. Besides being EWGS President and EWGS Treasurer many times, he held many appointive offices, and was the EWGS Researcher till 1998. He also made copies and mailed publications EWGS had published. Ray died October 22, 2003 and is buried in Mountain View Cemetery at Walla Walla, Washington. In 1976 EWGS membership grew by 20%. 1977 EWGS dues were $6.00. The Bulletin printed a Index to the Book of Deeds of Spokane County 1880-1883. Comments by Carrie Lartigue: 1976 Mr. Raymond Fisher -Is there an office or appointive committee in EWGS on which Ray has not served? I believe he, more than any other member, has helped more people, done more individual favors and contributed more to the betterment of this society than I could possibly list. Outside of Sundays..his second home is at the library in the Genie Room. Congratulations, Ray...we are proud you chose us for friends! Editors Comments: While I had met a few of the earlier EWGS Presidents, Ray was the first one I knew personally. I was a new genealogist when Ray suggested all the EWGS members join the genealogy bulletin board on Prodigy, I really liked that bulletin board and by reading posts every night I learned a lot about genealogy and later became a Special Contributor and eventually a Member Rep on the Prodigy Bulletin Board. 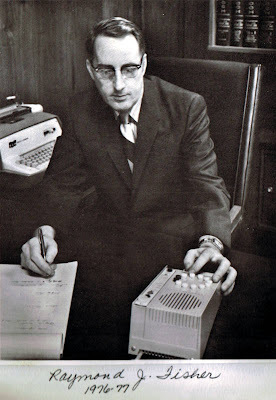 I started doing some look ups for queries for the Spokane area from Prodigy, and so when Ray decided to retire from the Research I asked the then President Elect John Zeimantz if I could replace Ray as the EWGS Researcher. John said no one could replace Ray but I could have the Research job on a trial basis and so on January 1, 1998 I became the new EWGS researcher. Ray still had some research he was finishing, and so he showed me around the courthouse, introduced me to the people in the auditors office and in the archives. Ray's advice to me was the best way to become a better genealogist is to do research for others, thanks Ray that was great advice. 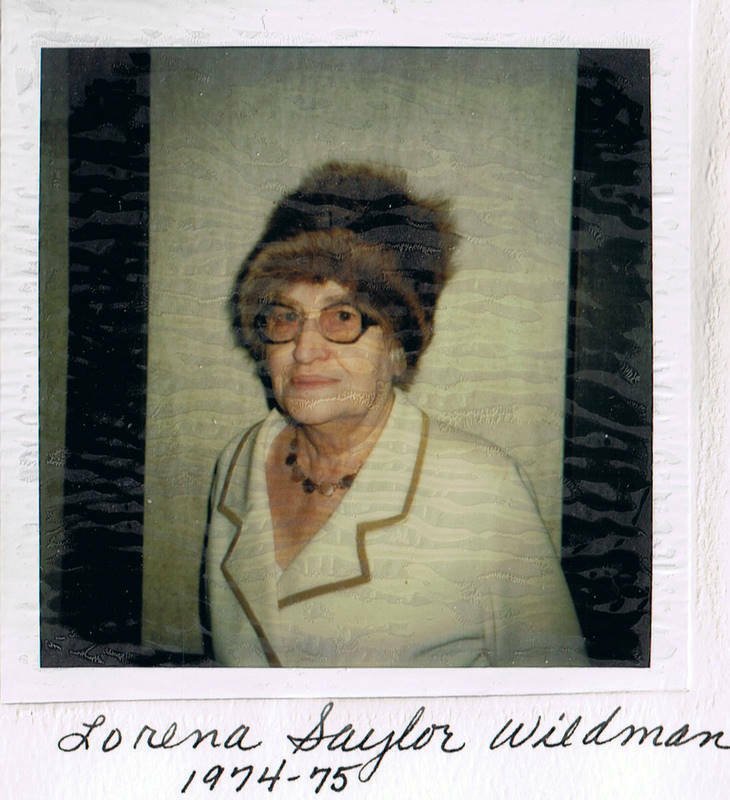 Lorena May Saylor Wildman was the EWGS President in 1974 and 1975. Lorena was born in Van Buren County Iowa July 2, 1911 to Robert R. and Mildred (Raines) Saylor. She grew up in Davis County Iowa. She graduated from Pulaski, Iowa High school and worked as a practical nurse. Lorena married Kelsey Atherton Wildman in October 1929, at Iowa City, Iowa. She authored four books on her family genealogy. Kelsey and Lorena came to Spokane in 1943 because of the War when a requiter from Spokane came to Iowa looking for workers for the local aluminum plant. Lorena was listed as author or co-author of several books in the Spokane Library: Early Marriages of Spokane Book A, 1880 Census of Spokane County, Early Wills (of Spokane County), 1880 Stevens County Census, Genealogical Guide to the DAR Magazine, Early Spokane County and Research tips in Pennsylvania. Kelsey Wildman retired from Spokane Sash and Door Company and died August 13, 1987. Lorena survived Kelsey till November 17, 1998. 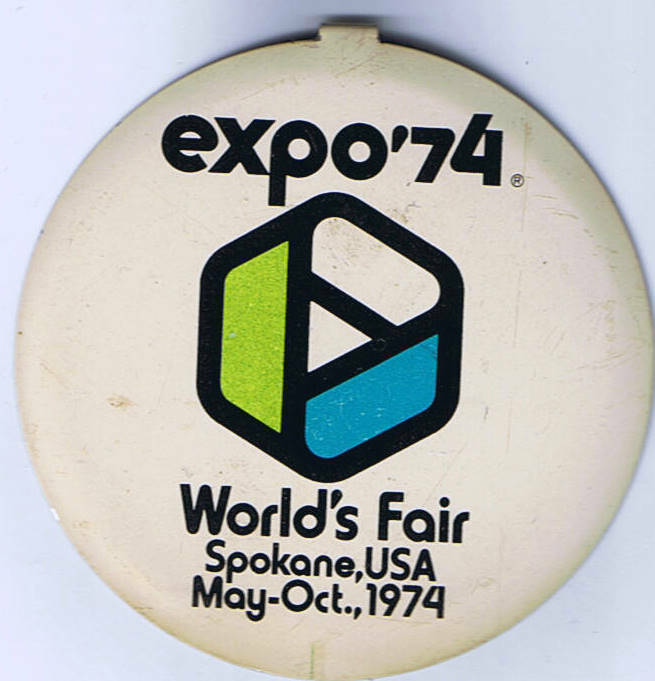 Expo 74 in September and conducted a Workshop September 13 and 14. It was Mr, Rubincam's first professional visit to the northwest. 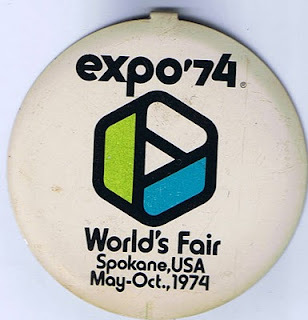 Expo 74 Postcards. Expo really changed downtown Spokane from an area of old railroad depots and decaying buildings across the street from the rail road depots. Today Riverfront Park is a lasting monument to Expo. Marie Earlene Stone was the EWGS President in 1972 and 1973. She was born in Cheney Washington in 1927 daughter of Alonzo Earl Stone and Hazel Marie Gorr. She graduated from Cheney High School and married August 3, 1947 Lamoyne A. Larson. Lamoyne was the son of Louis Larson of Minnesota and Eleanor Larson. They have two children Barbara Jo and Steven John Larson. 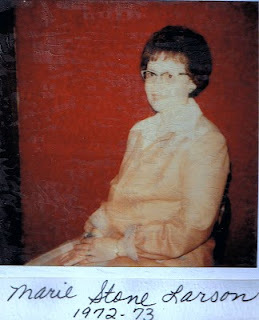 Marie joined EWGS in 1966. Her hobbies are sewing, knitting, genealogy and traveling. Her grandmothers parents were early Cheney pioneers (about 1877). Lamoyne died February 5, 1993 at Liberty Lake. Looks like Marie is still living, could not find a death date for her. In 1973 the Bulletin started a column called "Meet Your Fellow Members" and gave brief biographies of society members. "Our members are like snowflakes. All different, and all interesting". Marie's biography was the first one printed in 1973. 1973 was a bad year for genealogists, in July 26 million records of past and present military members were destroyed in a fire at a military storage building in Overland Kansas. President Marie Larson had a disagreement with a horse and broke her leg, she attended meetings with cast and crutches. 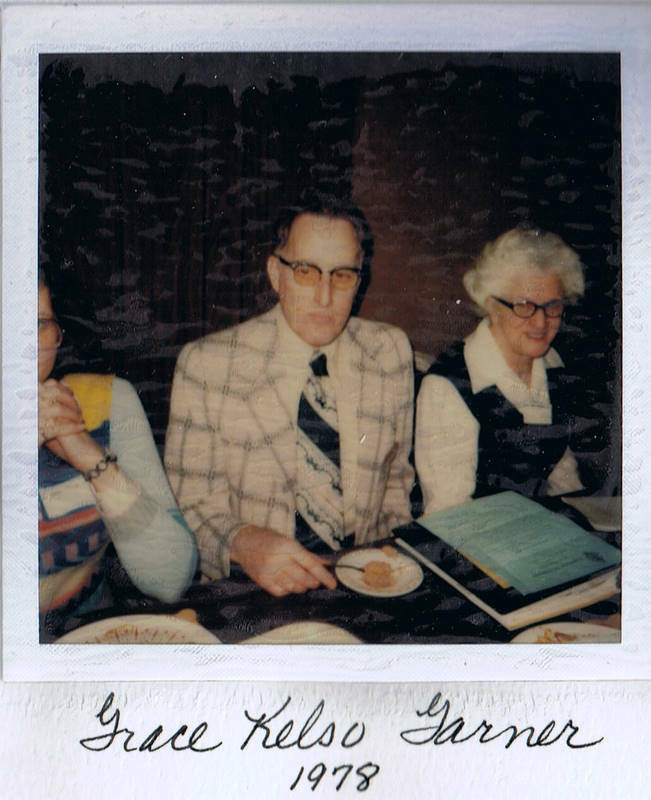 Comments by Carrie Lartigue: 1972 Mrs. L.A. Marie Larson - What can I say about Marie? She held many offices, in fact so many that she did not have time for her own research! Besides work at EWGS, she is a faithful worker at the Family History Center on Pines. She has become an expert on Scandinavian research. We haven't had a "What You Missed" post on this blog for over a year. Preparations for the Washington State Genealogical Society's State Conference held here in Spokane in September 2009 took up a lot of time, and so the WYM posts went by the wayside. I thought we'd start them up again! Each presenter shared what motivated them to join their group, the mission of their group, the qualifications and fees for membership, when and where local groups meet, and how genealogy or an interest in history plays a part in joining. Several pointed out similar groups that others could join; for example, when Pat Ewers did her presentation on the Van Voorhees Family Association, she mentioned that Cyndi's List has a page of Family Associations. She also referred the audience to Google, stating that many Family Associations could be found that way. Another thing to keep in mind is that along with all the many "Daughters of..." organizations, there are usually corresponding "Sons of ..." organizations. Also, many states other than Maine and communities other than Newbury, Massachusetts have "First Families", "First Settlers", or "Pioneer Families" Associations. You also don't have to have ancestry that stretches back deep into American history to join a lineage group: Doris Woodward briefly mentioned the Czechoslovak Genealogical Society, which provides pioneer certificates if you can prove your descendency from Czech immigrants. Most stated that the advantages of joining one of these organizations were to feel a strong sense of pride in their heritage, to reward themselves for the hard work of researching one of their lines, to access assistance in tracing an ancestor who might qualify them for membership, and to leave a genealogical record with the organization for future descendants. Many of these organizations have genealogical libraries, and/or do good works to preserve historical landmarks, or have community projects such as photographing Civil War veterans' graves. These repositories and projects contribute to society in general and are advantageous to us as genealogists, even if we are not members of these societies. The variety of organizations that were represented ensured a little something for everyone. I myself knew I qualified for several of these organizations, and I decided to pick up a brochure and application for the Daughters of Union Veterans of the Civil War, 1861-1865! What do you think? Did you like this program? Did it inspire you to consider joining one of these groups or a similar one? What other similar organizations are you a member of that you would like to highlight? Please click on the comments link below (where it has a number and the word "comments") to add your thoughts! If you're reading this from your e-mail inbox or from a feed aggregate such as Google Reader or Bloglines, please click this link to come directly to the blog so that you can leave your comments.